I am very excited about the Persepolis Trailer, which I received in today’s Very Short List. I read both of the Persepolis graphic novels in the last year. I was immediately absorbed into Marjane Satrapi’s life growing up in Iran and leaving as result of the Iranian Revolution. I don’t know a lot about the history of the Middle East, but the perspective of a young girl is quite enthralling. The graphic novel was a new medium to me. I know that a lot of people aren’t into the idea of reading a comic book type of story. 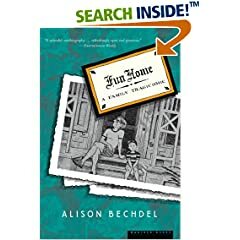 I read the two stories right after reading Fun House, another graphic novel by Allison Bechdel, who grew up in a funeral home. This autobiography examines her relationship with her deceased father, a English professor/mortician. Although I did enjoy Fun House, I felt like the constant references to her shared love of literature with her father a little pretentious. But I suppose that is just who they were. On the other hand, I found reading Persepolis to be refreshing. The story was much simpler and cleaner. The experiences and pages flew by and I was finished before I knew it. I can’t wait to see it on the big screen in its full black and white glory. I guess that I am quite addicted to this format because I read a third graphic novel that this year. 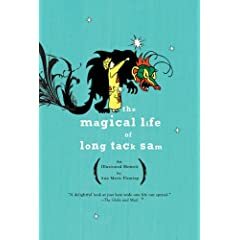 The graphic novel version of The Magical Life of Long Tack Sam was actually created after the movie, the opposite of Persepolis. This story of Ann Marie Fleming searching for her grandfather was a true treasure hunt as she continued living out the mystery of this famed magician. I really wanted to watch the movie, which debuted at a series of film festivals in 2004. I missed it. But there is a chance that I might catch it on Sundance. Well, not now, but hopefully one day. Wow, that movie looks amazing! I’ll have to watch it.